The Declaration of Independence, unanimously approved by the second Continental Congress on July 4, 1776, created a new nation, the "United States of America." Written primarily by Thomas Jefferson, it formally "dissolved the connection" between the thirteen American colonies (which were now using the name the "United Colonies") and Britain. July 4 is still celebrated as the nation's birthday. The document enshrines the basic values of republicanism as the foundation of America; it inspired similar declarations in over a hundred countries. The Declaration of Independence includes the most influential sentence even written in the English language: "We hold these truths to be self-evident, that all men are created equal, that they are endowed by their Creator with certain unalienable Rights, that among these are Life, Liberty and the pursuit of Happiness." Progressive historians have attempted to re-write history and leave the impression that No taxation without representation was the only reason for American Independence, when there were actually 27 colonial grievances cited against the king. 6 Long-term impact on U.S. Sentiment for independence was crystallized by Common Sense, the astonishingly successful pamphlet by Thomas Paine. It sold over 150,000 copies in spring 1776; copies were passed from hand to hand and read aloud at taverns in every colony. General George Washington was especially impressed and he had it read aloud to his soldiers. Paine's forceful argument convinced the majority that that the Empire was a dead weight on American aspirations, and the time was now to become independent. The Loyalists were left almost speechless. Support for the King, which had been fast dwindling away, evaporated after Americans digested Paine's philippic. Not only was liberty at risk under monarchy, Paine said, but so was peace, as monarchs had little else to do but lay "the world in blood and ashes." His key argument was an attack on the possibility of reconciliation. Paine convinced his readers that independence was more likely to bring peace and prosperity than continued subservience to the empire. But Paine drove ahead adding a millennial quality to the colonists' struggle. This was not a revolt over taxation. The survival of liberty and republicanism was at stake, he argued and if the American Revolution succeeded, generations yet unborn would owe a debt of gratitude to their forebearers who struggled to defend—-and expand-—freedom. Paine foresaw an America that would become "an asylum for mankind." Not only would America offer refuge to the world's oppressed, but like a shining beacon, revolutionary America would herald "the birth-day of a new world," the beginning of an epoch in which humankind across the earth could "begin the world over again." On May 15, John Adams wrote a preamble stating that because of the king's continued efforts to reject all efforts at reconciliation, independence from the crown was inevitable. The "Declaration Committee," consisted of five people: Thomas Jefferson of Virginia, Roger Sherman of Connecticut, Benjamin Franklin of Pennsylvania, Robert R. Livingston of New York, and John Adams of Massachusetts. It was appointed by Congress on June 11, 1776, to draft a declaration in anticipation of an expected vote in favor of American independence, which occurred on July 2. At this point the British had been driven entirely from the United Colonies, and independence became increasingly a reality. "Reason first, you are a Virginian, and a Virginian ought to appear at the head of this business. Reason second, I am obnoxious, suspected, and unpopular. You are very much otherwise. Reason third, you can write ten times better than I can"
(Jefferson's authorship was largely unknown before 1800.) He incorporated ideas and phrases from many sources to arrive at a consensus statement that all patriots could agree upon. Early drafts exist dating to June 1776. Jefferson's colleagues Benjamin Franklin and Adams made small changes in his draft text and Congress made more. The finished document, which both declared independence and proclaimed a philosophy of government, was singly and peculiarly Jefferson's. We hold these truths to be self-evident, that all men are created equal, that they are endowed by their Creator with certain unalienable Rights, that among these are Life, Liberty and the pursuit of Happiness.--That to secure these rights, Governments are instituted among Men, deriving their just powers from the consent of the governed. The first draught (they spelled "draft" differently at the time) of the Declaration is somewhat longer and contains more content than the final version that was accepted by all of the colonies. The most glaring difference is a reference to the efforts of the colony of Virginia to rid itself of the practice of slavery. The removal of these sections was by the request of only two states: Georgia and South Carolina. In the section which highlights slavery, Jefferson takes on a mocking as well as angry tone, using bold text and capitalized lettering to make his point. In one instance, Jefferson mocks the King as a "Christian" who at the same time has no problem enslaving other human beings. (This is not a Christian thing to do) In another instance, Jefferson highlights how the King took a decided stance against any efforts by Virginia to end the practice. Jefferson would have been particularly offended by this, as his first act in the House of Burgesses was a bill to abolish the slave trade. The bill failed by only one vote. Jefferson himself did not believe in absolute human equality, and, though he had no fears of revolution, he preferred that the "social compact" be renewed by periodical, peaceful revisions. That government should be based on popular consent and secure the "inalienable" rights of man, among which he included the pursuit of happiness rather than property, that it should be a means to human well-being and not an end in itself, he steadfastly believed. He gave here a matchless expression of his faith. The charges against King George III, who is singled out because the patriots denied all claims of parliamentary authority, represent an improved version of charges that Jefferson wrote for the preamble of the Virginia constitution of 1776. Relentless in their reiteration, they constitute a statement of the specific grievances of the revolting party, powerfully and persuasively presented at the bar of public opinion. The Declaration is notable for both its clarity and subtlety of expression, and it abounds in the felicities that are characteristic of Jefferson's best prose. More impassioned than any other of his writings, it is eloquent in its sustained elevation of style and remains his noblest literary monument. The concepts of natural law, of inviolable rights, and of government by consent were drawn from the republican tradition that stretched back to ancient Rome and was neither new nor distinctively American. However it was unprecedented for a nation to declare that it would be governed by these propositions. It was Jefferson's almost religious commitment to these republican propositions that is the key to his entire life. He was more than the author of this statement of the national purpose: he was a living example of its philosophy, accepting its ideals as the controlling principles of his own life. Congress adopted the Declaration on July 4, 1776, which became the birthday of the independent nation. The Declaration of Independence drew upon Christianity and the Enlightenment English philosopher John Locke. In his famous work "Two Treatises of Government" (1690), Locke declared that all men have the natural (inalienable) rights of "life, liberty and estate (property)." 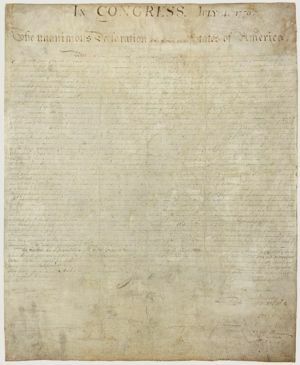 Notably the Declaration of Independence does not emphasize a right to pursue property, however, speaking instead in favor of pursuit of "happiness". Voting in Congress was by states and the Declaration was not unanimous on July 4 but became so a little later. On July 4, the New York delegation could not sign since its instructions to do so did not arrive until July 9. The original title referred to Twelve States, but all thirteen approved it. Several delegates were opposed at first but later signed. When the Declaration was signed, the 13 colonies now became the 13 states. The new nation created a national army under George Washington, and sent diplomats to secure recognition in Europe. Most successful was Benjamin Franklin, who won support in France and in 1778 secured a treaty of military alliance with France, by which the entire military and naval forces of France joined in the war against Britain. King George III refused to give up and of "his" possessions, so the war dragged on until the final American victory at Yorktown in 1781 caused Parliament to change the government in London and sue for peace. The first page of the Declaration of Independence as it began under Thomas Jefferson, with several strikeouts as he formulated his ideas. Americans celebrated the Fourth of July and often read the Declaration at that event, but paid little attention to it other days of the year. That changed when Abraham Lincoln in the Gettysburg Address of 1863 stressed its priority over the Constitution. Since then the statement that "all men are created equal, that they are endowed by their Creator with certain unalienable Rights, that among these are Life, Liberty and the pursuit of Happiness" has resounded strongly in the American psyche, though it is not echoed much in other countries. The Declaration was quickly translated into major languages and immediately sparked serious discussion in Europe and Latin America about the legitimacy of empires. By 1826, fifty years after the drafting, twenty nations already had declarations of independence modeled on it, starting with the Flemish 1790 Manifesto of the Province of Flanders and Haiti's 1804 declaration of independence. In the 20th century, the first wave of independence declarations came after World War I and the collapse of the Austro-Hungarian and Russian empires. The second wave lasted from 1945 to 1993, with the closing down of the Japanese, British, French, Portuguese and other empires. By the 21st century, over half of the 192 nations of the world have such declarations. Most, according to Armitage (2007), have copied the style and structure of the Declaration. Most important, the Declaration has marked and helped create the "contagion of sovereignty" that has transformed a world of empires into a world of states. The world was impressed with how colonies broke away from an empire, but it paid little attention to its more controversial metaphysical claims about all men being born equal with certain rights. Translators had great difficulty handling its key concepts. For example, the "unalienable rights" of life, liberty, and the pursuit of happiness were extremely difficult concepts in China, Japan, and Spain (where Catholic teachings placed true happiness only in the other world). The translators' difficulties with the Declaration also indicate that the document's "truths" about human rights were not nearly so "self-evident" as Jefferson believed. In China and Russia, particularly, the political rights of the individual were clearly not self-evident. Although Americans often enthusiastically championed the benefits of democracy throughout the world, not all nations or peoples appreciated the libertarian and capitalist values enunciated in the declaration. They did, however, appreciate its Republicanism, and most new nations declared independence in order to become republics. Gustafson (2002) traces the various locations where the Declaration, the Constitution, and the Bill of Rights, (known collectively as the Charters of Freedom), were kept until transferred with great ceremony to the National Archives in 1952. The Declaration was moved from one city to another and was at the Patent Office in Washington from 1841 to 1876, among other locations. The Declaration and the Constitution were in the Library of Congress from 1921 to 1952, amid some rivalry with the National Archives as to their proper location. As part of a new conservation effort, the National Archives constructed new encasements to preserve the documents and return them to public display beginning 17 September 2003. The Declaration of Independence is comprised primarily of five sections: The introduction, the preamble, the indictment of the British Crown, the denunciation of the citizens of Britain for turning a blind eye to the King's mistreatment of the colonists, and the conclusion. Proclaims the right of the colonists, upon the basis of their God-given rights, to separate from the abusive king. An expression of timeless truths that transcend all ages and generations. Lists the 27 grievous acts which the king has repeatedly committed to injure the liberty of his subjects in the 13 colonies. He has excited domestic insurrections amongst us, and has endeavored to bring on the inhabitants of our frontiers, the merciless Indian Savages whose known rule of warfare, is an undistinguished destruction of all ages, sexes and conditions. Denounces the people of Great Britain for not coming to the aid of the colonists as they were abused by their ruler. Asserts their reliance upon God for protection, as they knew the King would pursue a path of war. Palmer, Robert R. The Age of the Democratic Revolution: A Political History of Europe and America, 1760-1800 (2 vol 1959-64), influential comparison of European countries online edition of vol 1. Armitage, David. "The Declaration of Independence in World Context." Magazine of History 2004 18(3): 61-66. Issn: 0882-228x Fulltext in Ebsco. Discusses the drafting of the Declaration and the international motivations that inspired it, the global reactions to the document in its first fifty years, and its afterlife as a broad modern statement of individual and collective rights. ↑ Declaring Independence: Drafting the Documents. Retrieved on 2007-08-04. ↑ See "Transcription of the Fragment of the Composition Draft of the Declaration of Independence"
↑ See "Declaration of Independence"
↑ Eugene Eoyang, "Life, Liberty, and the Pursuit of Linguistic Parity: Multilingual Perspectives on the Declaration of Independence." Journal of American History 1999 85(4): 1449-1454. ↑ President Woodrow Wilson referred to the preface of the document as something you should overlook. Publishing the Declaration of Independence, June 24, 2005 webcast by Robin Shields at the Library of Congress. The drafting committee presenting the Declaration of Independence to the Continental Congress, painted by John Trumbull 1817–1819. This page was last modified on 9 April 2019, at 02:10. This page has been accessed 99,678 times.